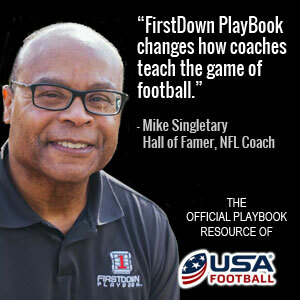 FirstDown PlayBook has 5250 different base defensive looks in your varsity football section. Stop and pause for a second to think about that for a moment. That’s 5,250 unique defensive play drawings available to you to use as either a reference tool for your defense or also for your offensive coaches as they begin drawing practice cards for the scout team defense. Keep in mind that we are not talking about any of the specialized sections in FirstDown PlayBook like the defensive pressure section or the short yardage & goal line section and even the “Spread Beaters” section. All total the Varsity defensive section includes over 10,000 play drawings. No where else on the planet will you find anything like this. Now stop and think about what the combination of the Defense Builder and the new Draw & Edit tool is going to do to improve your life. Yes, it’s not an overstatement. This is going to change your football life and quite possible change your life period. You see, coaches all fight at least one common opponent and that opponent is time. We here at FirstDown PlayBook know because we did it for thirty years! We all struggle with the daily and weekly grind of getting ready for practice and getting ready for your position meeting and that doesn’t include the massive amounts of time spent on game planning during each and every week. Here’s what else we know. If someone is trying to sell you on something that just allows you to draw football plays then you can bet that they have never coached football. The idea is to NOT DRAW PLAYS. The less time you are spending drawing football plays, the more time you can devote to actually coaching and developing your players on and off the field and maybe even having more time to devote to being a better dad and husband.